how quickly or slowly children of early human species grew up. While people used to think that there was a single line of human species, with one evolving after the other in an inevitable march towards modern humans, we now know this is not the case. Like most other mammals, we are part of a large and diverse family tree. Fossil discoveries show that the human family tree has many more branches and deeper roots than we knew about even a couple of decades ago. In fact, the number of branches our evolutionary tree, and also the length of time, has nearly doubled since the famed ‘Lucy’ fossil skeleton was discovered in 1974! There were periods in the past when three or four early human species lived at the same time, even in the same place. 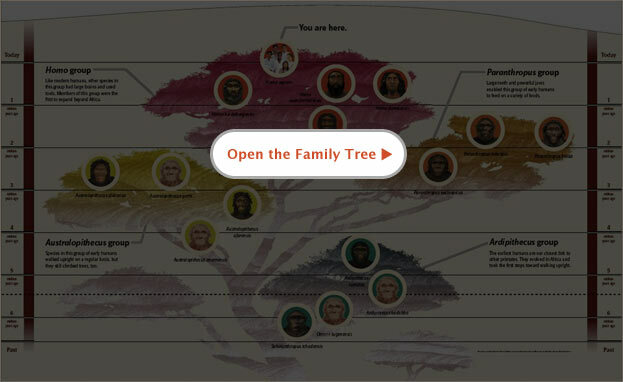 We – Homo sapiens – are now the sole surviving species in this once diverse family tree. While the existence of a human evolutionary family tree is not in question, its size and shape - the number of branches representing different genera and species, and the connections among them – are much debated by researchers and further confounded by a fossil record that only offers fragmented look at the ancient past. The debates are sometimes perceived as uncertainty about evolution, but that is far from the case. The debates concern the precise evolutionary relationships - essentially, ‘who is related to whom, and how.’ Click here to explore information about different early human species. When scientists discover a fossil skull, they compare it to skulls that have already been identified as particular early human species. Now you get to be the scientist!